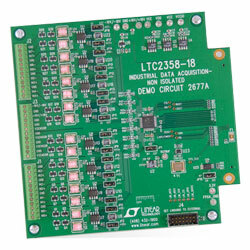 Analog Devices 2677A Demonstration Circuit is a reference design for robust industrial data acquisition applications for the LTC2358-18. The device has high voltage measurements with a large input common range. The device executes input protection up to 400V of continuous input protection. It can survive extreme abuse and is coupled with gas discharge tubes to give protection from surges. This reference design includes the LTC2358-18 SAR ADC, ADA4522-2 dual zero-drift operational amplifier, and an LT6658 dual-output, high current reference for sensor excitation. The digital interface is an HSMC, which is compatible with Altera Cyclone V SoCkit and other Altera FPGA evaluation boards that support 3.3V CMOS I/O.